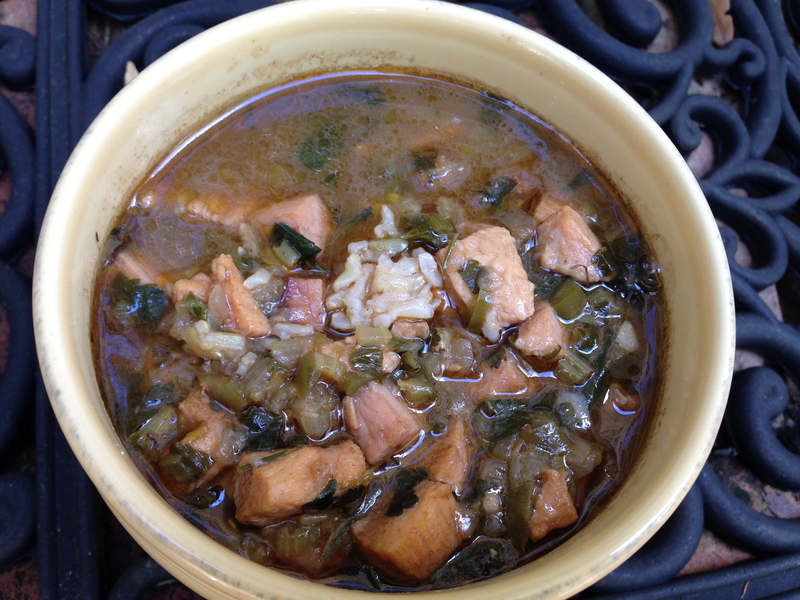 Sausage and Chicken Gumbo, Y’all! Lent is coming up, Gentle Reader, and as I say to myself EVERY year, “I’ll be ready. I’m ready.” I eat a little meat and think, “Okay. I’m good”. But a week or two later I start wanting chicken…in a Puerto Rican stew or Greek style with lots of lemon, olive oil and oregano. Or a little charred, grilled flank steak, rare and sliced thin on top of a HUGE salad. But that’s the name of the game. Sacrifice. Fasting. Sigh. Anyway, to circumvent that longing I’ve been meating up. I figured there’s plenty of time for shrimp gumbo so when I planned this batch I focused on the OTHER white meat. 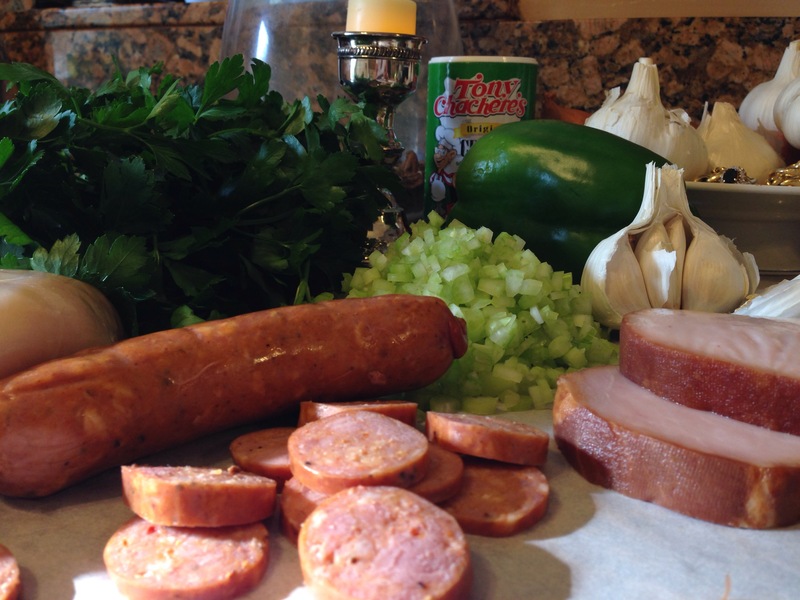 Smoked pork and Andouille sausage backed up with chicken. Sounds good, no? I thought I’d start with a dark, chestnut colored roux and masses of vegetables. The trinity, of course, finely chopped sweet onion, bell pepper and celery. Don’t be tempted to cut corners and buy that frozen stuff. It has NO flavor. Truly. Then heaps of freshly chopped garlic and flat leafed parsley. I’d use chicken stock as my broth and season with a heavy hand of cayenne pepper and Tony Chachere’s. If you don’t know the glories of Tony Chachere’s then you’re in for a pleasant surprise. It’s loaded with salt but it’s used in place of salt. So throw it on your chicken, fries, omelets, fish, really anything. But check it out. It’s got a great little kick. Tony Chachere’s can be found on the spice aisle in your grocery store. If your store doesn’t carry it you order it on Amazon. I started by making a roux. The darker the roux the less it thickens but that’s all right because I wasn’t going to make my gumbo soupy. 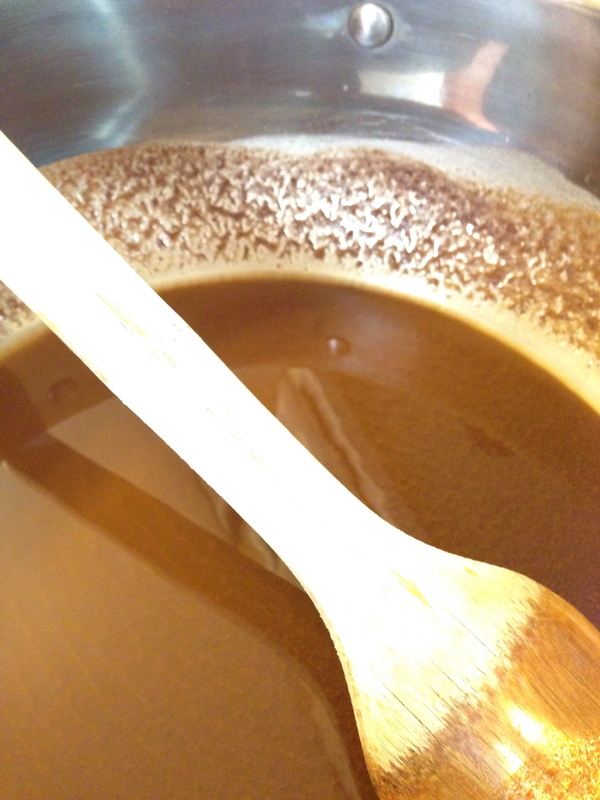 I wanted my roux a rich, nut-brown color. Reblogged this on The Irreverent Kitchen. I was in Mobile last month for work and had some great gumbo. Guests at the hotel were iced in and one of the staff members make gumbo and rive for everyone. It was delish. I am going to the store tomorrow and will take with me your ingredients list so I and try to make it myself. Thanks! Good!! It’s so easy!!! Enjoy!! !